Almost 100 dogs - some so sick that they needed overnight hospitalization, others "skin and bones" from lack of food and frequent breeding, and most traumatized from being locked up for years in waste-filled cages - have been rescued from a breeder in Virginia. The dogs - Great Danes, Mastiffs, Pugs, Boston Terriers, Yorkies, Poodles - are suffering from ear and eye infections, severely matted fur and dental problems, according to the Humane Society of the United States. "The dogs that required emergency medical care are now doing well," Justin Scally, manager of the HSUS puppy mill task force, told Love of Dogs. "The dogs did survive and were released from the hospital; one of the dogs is expected to deliver a litter of puppies any day now." Officials from HSUS, Augusta County Animal Control and the Virginia State Vet's Office removed the dogs from Oak Leaf Kennel near Staunton, Va. The dogs (like the one in photo above from the HSUS) have been placed temporarily with several animal welfare organizations, which will help rehabilitate them and eventually place them into homes. The organizations caring for the dogs are the Augusta Regional SPCA, the Norfolk SPCA, Richmond SPCA in Virginia, SPCA of Anne Arundel County in Annapolis, Maryland, and the Washington Animal Rescue League in Washington, D.C. Some of the pregnant dogs were in particularly bad shape, Mr. Scally states in a media release. "Their bellies were round with pregnancy, but the rest of their bodies were just skin and bones. 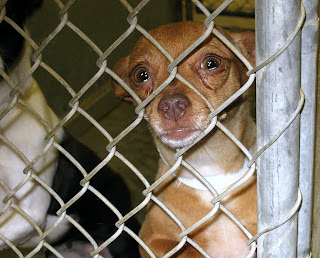 All of the dogs were frightened and surrounded by a stench that can only come from years of sitting in their own wastes." The dogs were given baths, groomed and treated for physical problems, but they also are suffering from emotional problems from their long-term confinement, Mr. Scally said. "Anytime animals are living in constant confinement, we are concerned about their physical and mental health." Mr. Scally says is optimistic that the dogs can be rehabilitated and eventually placed into good homes. "This process will require time, love and compassion. Veterinary treatment has been started on these dogs, but the emotional treatment will require time and compassion from their new owners. It is our experience that the public will open its heart to these dogs and there will be more than enough families looking to give these rescued dogs homes." Several of the dogs are pregnant, so the number off dogs eventually needing homes will grow, Mr. Scally said. "Anytime during a puppy mill rescue it is difficult to give a complete number of animals that will need placement when several are pregnant. I can tell you that some of the animals who were pregnant have not yet delivered their litters. One dog in particular that comes to mind with this is a pregnant Great Dane who is due to deliver her babies any day." Annette Davis, rescue coordinator for the SPCA of Anne Arundel County, welcomed the Great Dane with open arms and a box of dog treats. "We'll make sure she puts on some much needed weight before the demands of motherhood set in," Davis states in a media release. "After all her puppies are weaned, she will be spayed and prepared for a loving, new home." 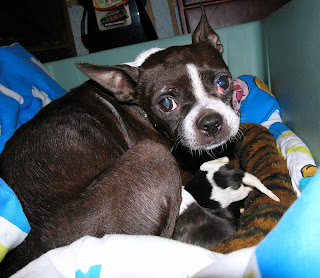 Another dog, a Boston Terrier by the name of Moxie (at left with puppies in photo from the Norfolk SPCA), has given birth to one pup, but lost two during an emergency c-section delivery, according to Suzy Swims, shelter operations manager for the Norfolk SPCA. "Our doctor says that if she had given birth at Oak Leak Kennel she and the babies would have died," Ms. Swims told Love of Dogs. Despite the ordeal, Moxie is proving to be a great mother, Ms. Swims said. She is taking good care of her own pup and has become a foster mother to three Beagle puppies who lost their own mother. "Moxie is letting the three Beagles nurse along side her own puppy," she explained. The Norfolk SPCA took in 24 of the dogs and the cost of taking care and rehabilitating them is expensive, Ms. Swims said. In addition to medical costs, an animal shelter also has to put on extra staff. "It can cost hundreds of dollars for each animal," she said. Mr. Scally says estimating the cost of rehabilitating one of the dogs is difficult because each have their own needs. "Some of the dogs will require more intensive care than others, and thus this will require more expenses. However, we must remember that the care of a pet is never inexpensive." 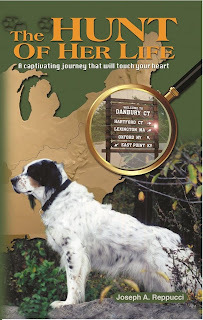 Mr. Scally encourages people to make donations to the organizations caring for the dogs - Augusta Regional SPCA, Norfolk SPCA, Richmond SPCA, SPCA of Anne Arundel County and Washington Animal Rescue League - or to the HSUS Puppy Mills Campaign.